I’ve been a blackberry gleaner for as long as I can remember. 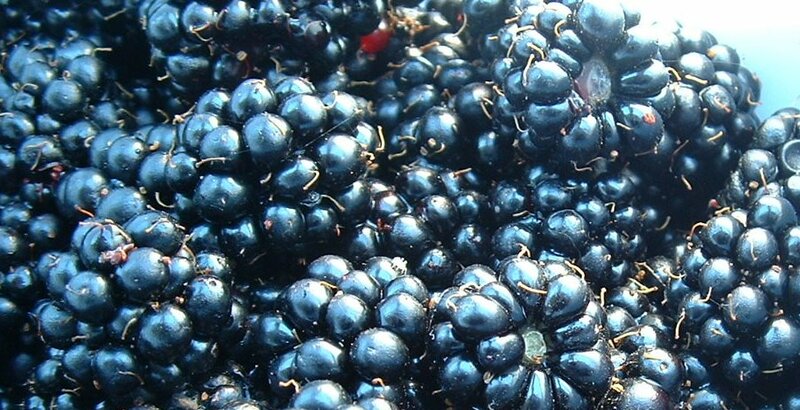 When my husband and I were students, we lived near a vacant lot that had a sizeable blackberry patch. In the evenings I would go out to look for our cat, Bear, who liked to hang out there and hunt for mice, and I would usually take the time to pick whatever berries I could find. My darling man finally pointed out to me one night that the neighbors probably thought I was completely off my rocker, as I stood there happily raiding the blackberry bushes, all the while calling “Beary! Beary!”. I was very careful not to do the two things simultaneously after that. My inlaws have a large blackberry patch along the side of their house, covering an inaccessible slope that runs between them and their neighbor. The only real way to pick them, unfortunately, is to lean precariously over the balcony, cutting the heavily laden clusters from their branches with long handled pruners, while someone else catches them in a homemade contraption consisting of a large coffee can attached to a long handle. This is what we did for an hour or so on Monday morning before we left to catch the ferry home. If you could taste these babies, you would understand why we go to such great lengths to get them. I think blackberry jam must be what they’re referring to when they say “the nectar of the gods” – I can’t think of many things that taste better. Even after spending 7 hours making the trip home (a trip that should in all reality take no more than 3, but that’s another story), I had no reservations about pulling out my canning equipment and whipping up a batch of the luscious stuff. The delicate berries don’t travel well, and by the time we got home they had started to reduce themselves to juice, and there was no way I was going to let them go to waste. Now the only hard part is trying to ration what I’ve got so I have some left until next blackberry season. We are going blackberry picking this weekend. My father-in-law wants me to make him jam for christmas. Looks good. Now I am hungry. A wise man, your father-in-law.